OK, it’s not strictly accurate to call them all kids anymore; some are in college now, and most are old enough to vote. More than that, in spite of the tragedy they’ve lived through–or maybe partly because of it–they’ve developed a strategy to promote social change effectively. 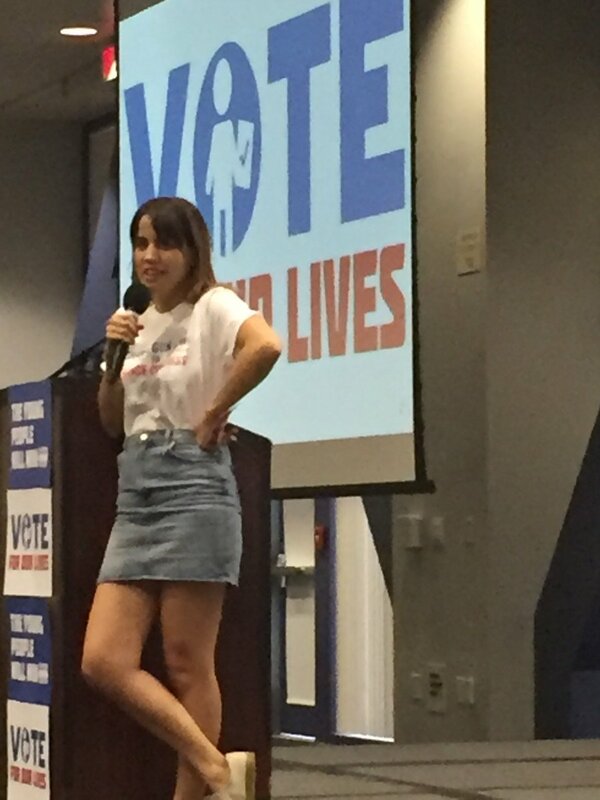 Since the large #MarchforOurLives demonstration in Washington last March, the Parkland activists have been on the road, connecting with local groups across the country and focusing intently on registering and mobilizing voters for the midterm election, now just days away. Organized on a tight timeline, the rally in the campus center was poorly publicized, but a few hundred people attended–not all college students. I spotted a few of the graduate students I work with; they turned up early. I don’t know if any of the undergrads in my social movements course showed up. I’m sure some of those attending finished with college long ago, and that others were still scratching away at high school. The Parkland kids have done scores of these events, displaying a comfort with the crowd and a routine extremely well designed to engage and inspire. They brought snack food, tee-shirts, and buttons to share, and announced that buses would be available to take local voters to City Hall to post their ballots early. 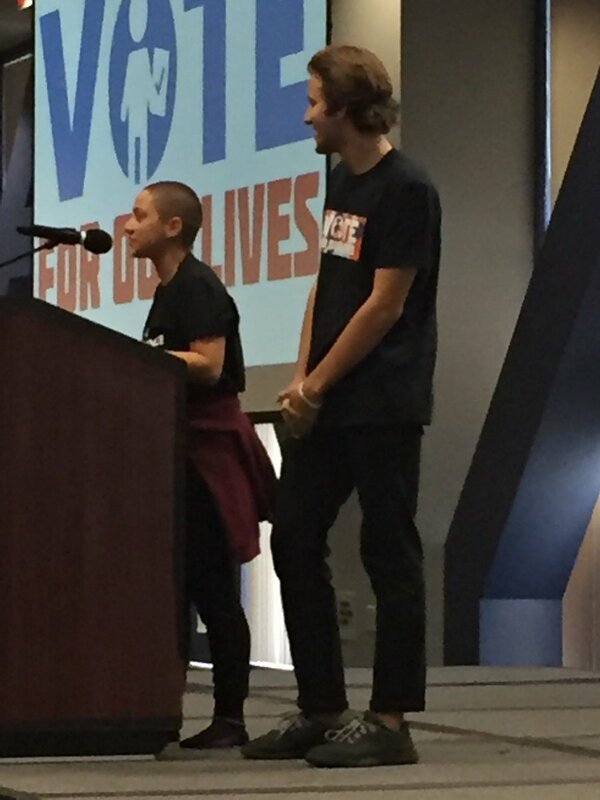 The most familiar speakers, Emma Gonzalez and David Hogg, were visible, but they shared the stage with local activists and candidates for office, as well as a wonderful acapella group from UCI. (Forgotten names and crappy photos are my work!) Sage and Chika sang, and then showed their video, Safe. 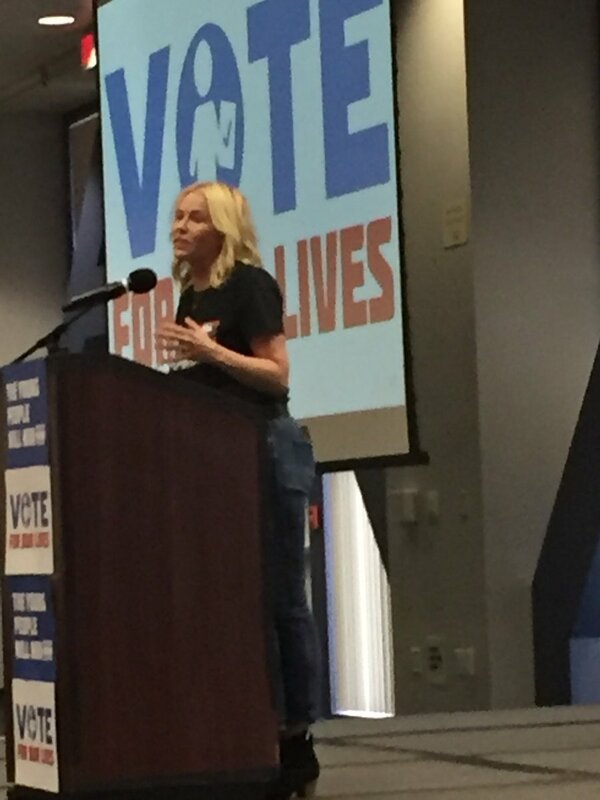 Celebrities Chelsea Handler and Natalie Morales, who have both been working for Democratic candidates in Orange County, spoke, and came off as earnest, well-informed, and completely committed. It was a little interesting that Handler, who makes her living as a comedian, didn’t tell any jokes as she stressed the importance of voting, and flipping the House of Representatives. Modest gun control measures were at the core of the political agenda, even as the Parkland kids were ready to connect with other issues about their futures–and the futures of other young people–including climate change, mass incarceration, immigration, and college costs. Policy details are on websites, but the main message from the podium was about engagement, repeated with urgency and optimism. They talked a little about the horrible day early this year when a disturbed young man armed with an assault rifle killed 17 people at their school. They spent more time explaining how they responded by organizing a movement. Delaney Tarr described their effort as a way to turn anger into hope. They talked about facing people who made fun of them and threatened them, traveling non-stop and getting little sleep, and they talked about meeting and talking with all kinds of people across the United States. Very short speeches and brief appearances by a few candidates for Congress and local office, including three teens running for city councils, were woven in with a little music and one brief chant. The overall tone was one of joyful and purposeful engagement, focused on Tuesday’s election, but oriented to promoting sustained engagement in the political process. We have to vote in EVERY election, Emma Gonzales said. As in Washington, DC, all of the young activists appeared on the podium at the end. They left the stage to rousing applause, but didn’t leave the room, waiting to talk with anyone who wanted to chat. Even after local organizers led young people to the buses, the Parkland kids stayed, talking policy or strategy, and posing for photos with anyone who wanted one. They understood that they’ve become celebrities themselves, and were ready to use their notoriety to build a movement and create new activists. I was impressed with how interested they seemed in everyone who wanted to spend time with them. If you want to build and sustain a powerful democratic movement, you have to learn to listen to people. Whether or not this was part of the curriculum at Marjory Stoneman Douglas, it’s something these activists learned well. These young people are wonderful: smart, pragmatic, committed, and kind. And all across the country, there are lots and lots of other young people just like them. This entry was posted in Uncategorized and tagged #MarchforOurLives, #VoteforOurLives, Chelsea Handler, Chika, David Hogg, Delaney Tarr, elections, Emma Gonzales, Gil Cisneros, guns, Harley Rouda, Irvine, Marjory Stoneman Douglas, Matt Deitsch, Natalie Morales, Orange County, Parkland, Sage, students, university, University of California-Irvine, voting. Bookmark the permalink.